Everything Changes – The Guide to Young Adult Cancer » Do you give thanks for your illness? Before diving into their turkey, most families take time to go around the table and say what they are thankful for. Not my family. We are all about the food in the Rosenthal household and we always have been. This doesn’t bother me. I come from a very demonstrative family. We express our gratitude on a regular basis, when it hits us in the moment. We don’t store it all up for a once a year gratitude fest. I do have a ton that I am grateful for in my life. But cancer is not one of these things. Cancer has lead me to become a less judgmental person. I listen to others now in a way that I didn’t before. It has also turned me into a writer. But I feel pretty confident that I’ve always had the capacity to become a less judgmental person and a writer. If it didn’t come out through cancer, it would have come out through another, hopefully less painful route. My dog, my husband, my mom and dad, my father-in-law, my friends, my health insurance, and a roof over my head are on my list of things that I’m grateful for on a regular basis. Cancer is not one of them. What about you? Is cancer on the list of things for which you give thanks? 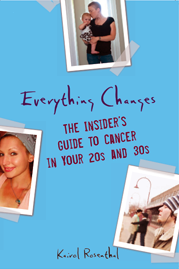 To read other perspectives about cancer and gratitude, check out my book Everything Changes: The Insider’s Guide to Cancer in Your 20s and 30s.